American Servicemembers need your support right now! The rare color photographs were taken by B-26 crewmember John Meyers (now deceased). What makes these photographs especially rare is that they are in color. Not only was color film in its infancy at the time but color photographs were strictly forbidden as well. Even "official" photographers of the day were required to use black & white film. Lucky for us that John Meyers didn't take such rules seriously. And lucky for him he didn't get caught! The (color) pictures were carefully scanned from 35mm Kodachrome slides and manually color corrected to the best of my ability. The slides appeared to be originals (or at least copies made shortly after the war) judging from the deterioration of the film. There appeared to be tiny bubbles embedded in the film. Fortunately most of them can't be seen on these scans, although some discoloration is visible. These pictures are courtesy of Skip Young of the 386th Bomb Group. Many, many thanks Skip!!! Click here if you are unable to download or view the large pictures. Click here to find out how to order your full color print of a 386th Bomb Group B-26 Martin Maurader. 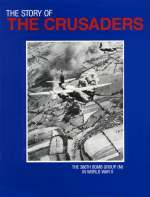 Click here to find out how order your copy of "The Crusaders", the story of the men of the 386th Bomb Group.